On a wild night out Lishman seduces the beautiful Natasha Rok. Three days later, news of Natasha’s murder is splashed all over the newspapers and Lishman is the prime suspect. Lishman, unable to remember much about the drunken night of passion, makes a snap decision to run. He becomes a fugitive hiding out on the backstreets of London, hunted through underground tunnels and canal networks. With the help of Dani, an edgy female photographer friend, he ventures into the murky world of East End gangs and conspiracy theories to unravel the mystery behind Natasha’s death and try to save himself. 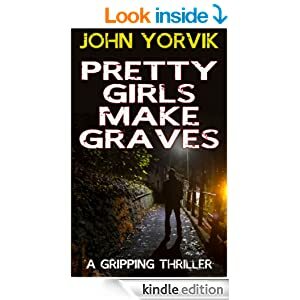 PRETTY GIRLS MAKE GRAVES is a gripping thriller by the talented new writer John Yorvik. 'Pretty Girls Make Graves' is the first part of the Camden Noir trilogy. Book 2 will be available in late 2014. Follow John Yorvik on twitter @FrontLip for latest news.